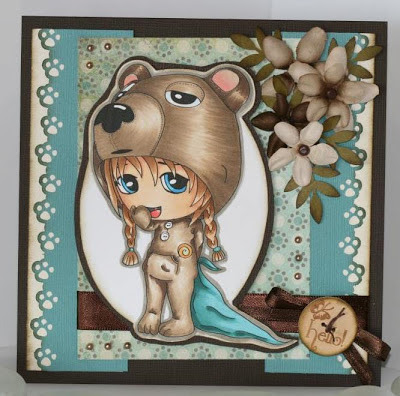 is the theme for this months challenge at Whimsy Stamps. Well great to see you back. The sun is shining I can hear lawn mowers going. What a wonderful sound. I'm glad that the weather has finally gotten better. Everyone was sure sick of the spring snow that kept coming. I do believe that summer is just around the corner. YAHHHH! This is a adorable wood button from Prima Marketing that says Hello. The corner arrangement of flowers also from Prima. Supplies: My Minds Eye patterned paper, Bazzill cardstock, EK paw border punch, Martha Stewart leaf punch, Prima Marketing flowers & wood button, copic markers, distress ink, Offray ribbon, Zva pearls. Wow way to go friend, so awesome, love the image, the border and the coloring...is amazing...great job! That image is so adorable and your just took it to a new level. The colors and embellishments are perfect. Love it! Thanks for sharing your work with us at Love to Scrap! Challenge Blog. Amazing. Thanks for playing at Love To Scrap! Fabulous card and lovely flowers. Thank you for joining us at Card Mania Challenge. Awwwww. So very cute. Love the image and your amazing coloring. Thank you so much for playing with us at Love to Scrap challenge blog. Gorgeous Card, colors and image. I love the layout to. Thank you for sharing with TTCRD. Love the image!! Thanks for playing along with us at Loves to Scrap! !